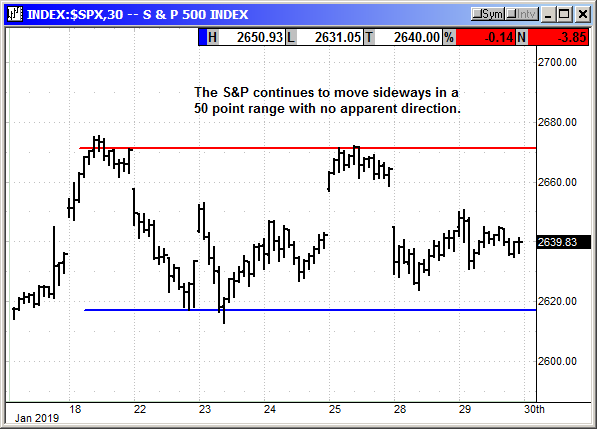 The major indexes moved sideways again as they waited on Apple earnings. I don't know why Apple controls so much of market sentiment. It is just a tech company with one major product. It is no longer the largest company by market cap, but it is still the 800 pound gorilla. 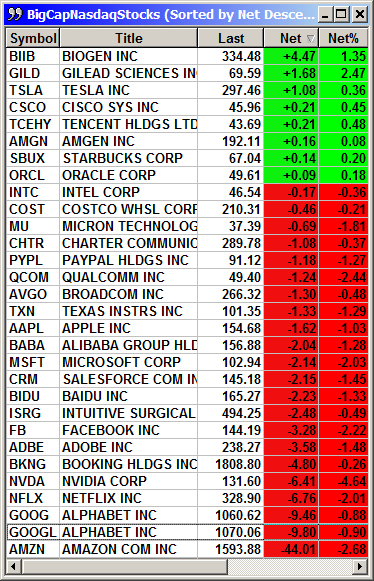 The tech sector and especially the chip stocks declined ahead of the event. Hundreds of headlines throughout the day and the week devoted thousands of lines of content on whether Apple would miss on earnings and/or guide lower again. Even the Dow traded sideways in a choppy tape while investors waited. 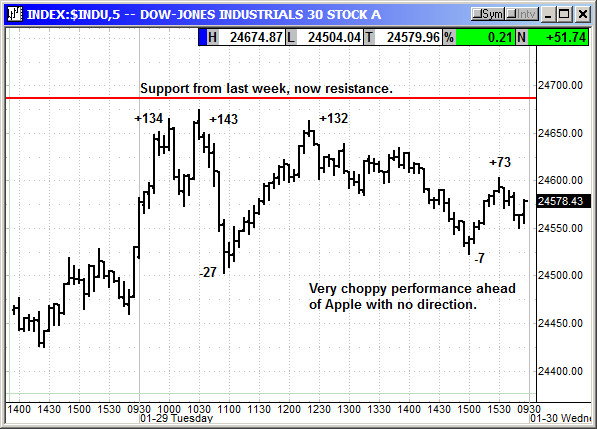 The Dow had other challenges with weak guidance from components but there was no direction. 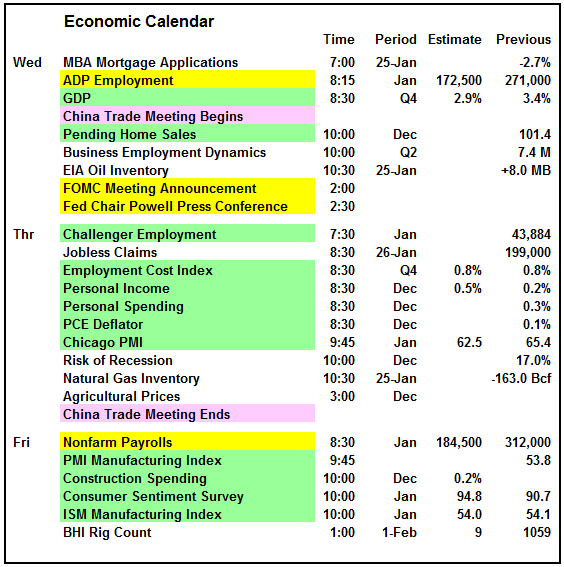 There were only two economic reports today and the biggest surprise was the consumer confidence for January. The headline number declined from 126.6 to 120.2 after a 10-point drop in December. This is now the third consecutive monthly decline and the lowest level since August 2017. The present conditions component declined only slightly from 169.9 to 169.6 but the expectations component fell sharply from 97.7 to 87.3. This is also the third consecutive decline from the 115.1 peak in October. That represents a 28-point drop in three months. 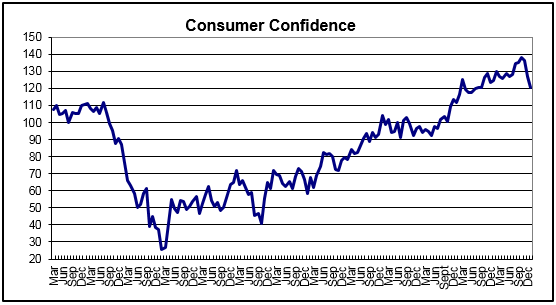 Confidence from middle-age respondents fell 7.2% with senior confidence falling 6.6% over the past three months. Respondents thinking about buying an auto rose slightly from 13.1 to 13.3%. Potential appliance buyers declined from 49.0 to 47.7%. However, potential home buyers surged from 5.9% to 7.8%. There are multiple reasons for the home buyer surge. Mortgage rates have declined, and home prices are moderating. Also, the home buying season starts in March and consumers are getting cabin fever from being house bound over the winter. It should be no surprise that confidence is crashing. We just ended the longest government shutdown in history at 35 days, China and the US are still locked in a trade battle and the Nasdaq and Russell 2000 were in a bear market at year-end. These numbers will spike quickly once the budget battle and Chinese trade agreements are over. The Case-Shiller Home Price Index for November showed that prices rose at only a 4.7% rate YoY compared to the 6.5% rate back in March. The housing bubble has cooled but prices are still rising only not as fast. This was for the November period and the report was ignored. Analysts missed on estimates again. After the bell the weekly API crude inventories reported a build of 2.1 million barrels for the week ended on Friday. Analysts were expecting an 8.0 million barrel build to equal the same eight million reported by the EIA last Wednesday. Gasoline inventories rose 2.2 million barrels and distillates rose by 211,000 barrels. 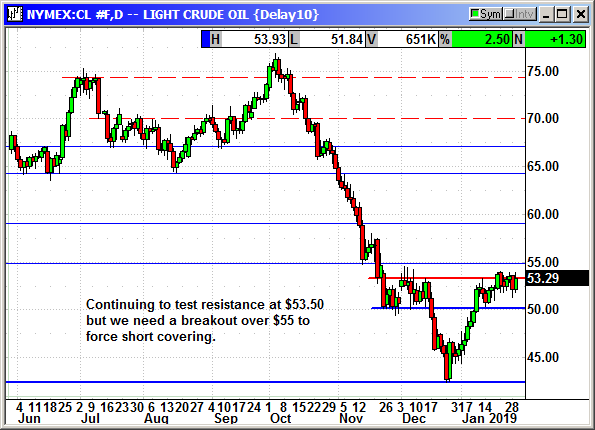 Crude prices were up after the US said it would impose sanctions on Venezuela oil and assets in the USA. Saudi Arabia said it would cut production even more to offset the lack of agreed cuts by Russia. Russian production actually rose 81,000 bpd in the last month reported. The oil minister for the UAE said the market should rebalance in Q1 and should the cuts prove insufficient OPEC was prepared to cut production even more. The trade meeting with China's Vice Premier Liu He leading the Chinese delegation is slated for two days starting Wednesday morning. As long as the meeting does not breakup into a shouting match and end early, the market should see this as a good sign that negotiations are proceeding. There was an abrupt end to a meeting several months ago when there was no progress being made. The meeting comes at a bad time with the US filing criminal charges against Huawei for theft of intellectual property and the request for extradition of the CFO from Canada for prosecution. This will color the trade talks although both sides claim it is a separate issue. The ADP employment report is due out before the open and is expected to show a gain of 172,500 jobs with the whisper number slightly higher. For the week of January 19th, the jobless claims fell to 199,000 and the lowest level since November 15th, 1969. This suggests employment is still increasing at a steady rate. The FOMC meeting decision will be announced at 2:PM and the Powel press conference will be at 2:30. Nearly 100% of analysts surveyed believe there will be no rate hike at this meeting. Many do believe the Fed could lower the rate of balance sheet reductions in order to give the markets confidence they are really in a data dependent mode. After the bell Apple reported earnings. Everyone can now relax. The company reported earnings of $4.18 that beat estimates of $4.17 by a penny. Revenue of $84.3 billion beat estimates for $84.0 billion. China, the previously mentioned reason for the earnings warning, saw revenue of $13.2 billion, down from $18.0 billion in the year ago quarter. iPhone revenue declined from $61.1 billion to $51.98 billion. Analysts were expecting $52.8 billion. Record services revenue of $10.9 billion narrowly beat estimates for $10.8 billion. Apple reported its gross margin on services for the first time at 62.8%. Tim Cook took exception with analysts who claimed services could not grow without iPhone sales. He disclosed the active user base of 1.4 billion phones, 900 million of which were iPhones, were actively adding services to things like iTunes and iCloud. That means each of those 1.4 billion consumers spent an average of $7.71 on services for the quarter. Cook has to either convince them to add additional services or convince the cheapskates to begin using the services. Apple claimed it quit reporting iPhone units sold because it was no longer a hardware company but a services company. Unfortunately, services accounted for only 12.9% of their revenue while 87.1% of their revenue came from hardware. Their claim is not supported by their numbers. For Q1 they guided for revenue of $55-$59 billion and lower than the current consensus forecast of $58.9 billion and far lower than the pre-warning consensus of $64 billion. On the positive side Cook said January sales in China were tracking better than December sales. However, he said demand was still weak and sales would probably come in below expectations. Cook said the company was rethinking how they price iPhones outside the US since converting dollar prices into local currencies made them even more expensive. Apple was forced to cut prices in China by 20% late in Q4 to clear out some inventory backlog problems. I suspect that Apple has also figured out that raising the price of your top line phone to $1,350 priced it out of the market for a lot of consumers. They bought back $8.2 billion in shares in Q4, less than the $19.4 billion they purchased in Q3. Net cash on hand has declined to $130 billion but that was a $7 billion increase from Q3. Shares rallied roughly $8 in afterhours. Nasdaq futures are up +35 while S&P futures are flat. 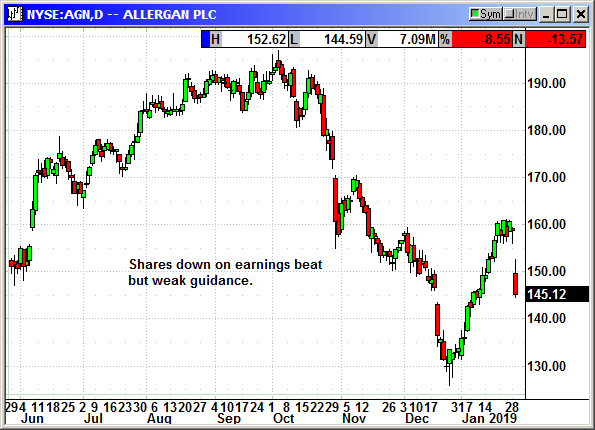 Allergan (AGN) shares fell 8.5% after reporting adjusted earnings of $4.29 that beat estimates of $4.16. Revenue fell 5.7% to $4.079 billion but still beat estimates for $4.005 billion. They guided for 2019 earnings of $16.36 on revenue of $15.0-$15.3 billion. Analysts were expecting $16.34 and $15.4 billion. For Q1 they guided for earnings of $3.40-$3.60 and revenue of $3.4-$3.5 billion. Analysts were expecting $3.73 and $3.64 billion. Shares fell $13.57. 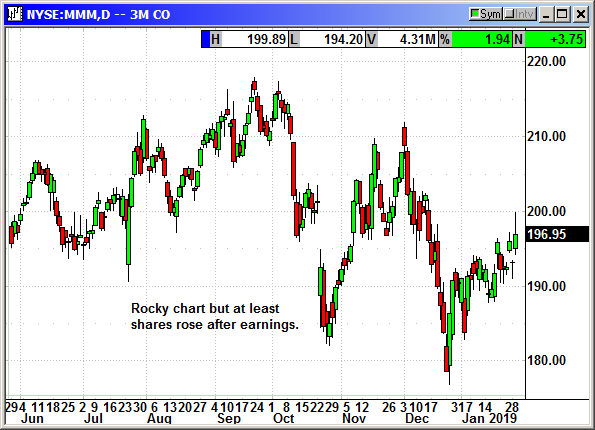 3M (MMM) reported earnings of $2.31 that beat estimates for $2.28. Revenue of $7.945 billion also beat estimates for $7.899 billion. They lowered guidance for 2019 from $10.60-$11.05 to $10.45-$10.90. Analysts were expecting $10.71. That put them just slightly below estimates at the midline. The company said it was seeing sluggish sales in China and expected organic sales growth to be in a range of 1-4%, down from prior guidance of 2-4%. On the positive side they said the hit from tariffs was now expected to be $70 million, down from the initial estimate of $100 million. Shares gained nearly $4 despite the lowered guidance. 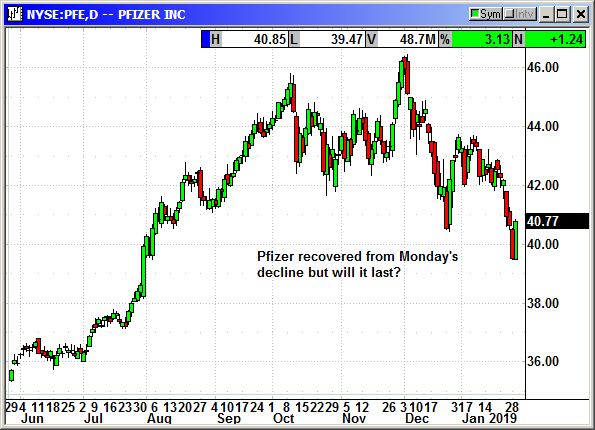 Pfizer (PFE) reported earnings of 64 cents that beat estimates by a penny. Revenue rose to $13.976 billion and beat estimates for $13.899 billion. They guided for 2019 for earnings of $2.82-$2.92 on revenue of $52-$54 billion. Analysts expected $3.04 and $54.3 billion so a miss on both metrics. The company bragged on its drug pipeline and said it would return to sustained growth by the middle of 2020. Pfizer said it had 15 drugs each with billion dollar per year potential coming to market over the next five years. One of its newer drugs, Lbrance, saw sales rise 58% to $1.13 billion due to surging demand in Europe. Shares recovered Monday's losses with a $1.25 gain. 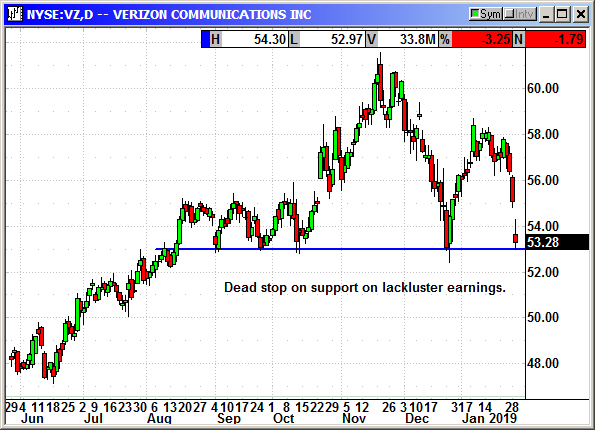 Verizon (VZ) shares declined 3% after reporting earnings of $1.12 that beat estimates for $1.09. Revenue of $34.3 billion narrowly missed estimates for $34.4 billion. The company added 1.22 million paid subscribers and that beat estimates for 1.07 million. They guided for low single digit revenue growth for 2019. 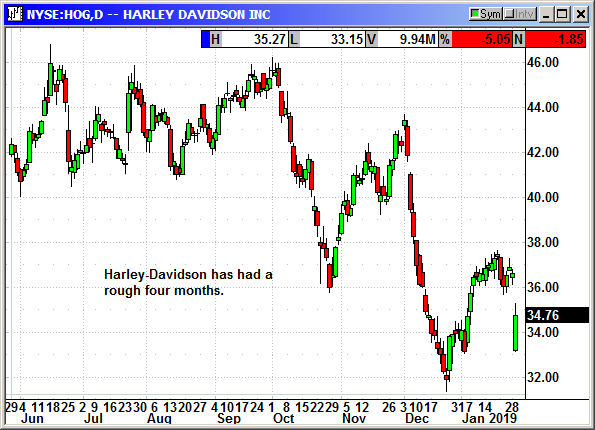 Harley-Davidson (HOG) reported earnings of 17 cents that missed estimates for 28 cents. Revenue of $955.6 million missed estimates for $1.05 billion. US motorcycle sales fell -10.1% and sales fell -6.7% globally. They expect to ship 53,000-58,000 motorcycles in Q1 and 217,000-222,000 in 2019. Hogs are just not as popular as they once were, and prices are significantly higher. Shares fell 5% on the news. 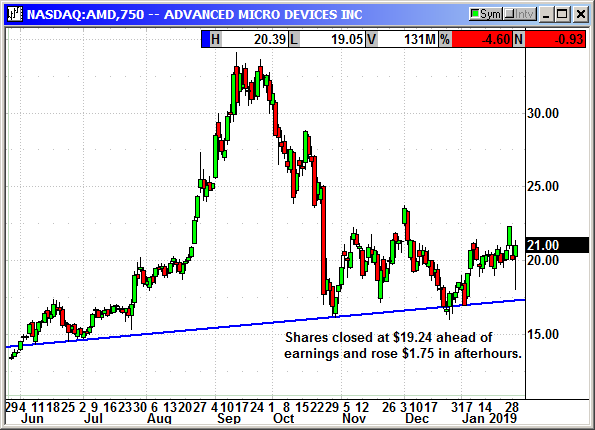 After the bell Advanced Micro Devices (AMD) reported earnings of 8 cents that matched estimates. Revenue of $1.42 billion missed estimates for $1.44 billion. They guided for Q1 for revenue of $1.2-$1.3 billion and analysts were expecting $1.65 billion. On the surface you would expect to see a sharp decline in the stock in afterhours. Instead shares rose nearly 10% or $2. The company said 2019 revenue should rise at high single-digit percentages and analysts were expecting 6%. Analysts were pleased to see that AMD's results were not as bad as Nvidia and their outlook was strong. Graphics chip sales rose 8.5% to $986 million and beat estimates for $939 million. The CEO said AMD planned to release 30% more Ryzen systems compared to 2018 and expects CPU sales to rise faster than GPU sales. Chip makers experienced a buildup of inventories in graphics cards after the crypto mining craze peaked. They have worked through that inventory and AMD expects regular video card sales to resume in Q1. 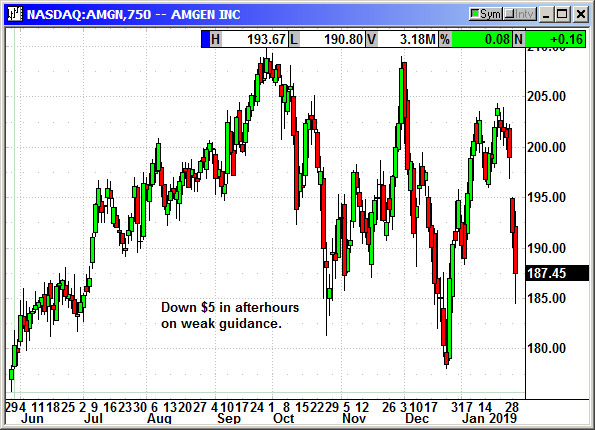 Amgen (AMGN) reported earnings of $3.42 that beat estimates for $3.27. Revenue of $6.2 billion beat estimates for $5.8 billion. They guided for 2019 for revenue of $21.8-$22.9 billion and earnings of $13.10-$14.30. Analysts were expecting $22.9 billion and $14.57. Shares declined $5 in afterhours. Ebay Inc (EBAY) reported earnings of 71 cents that beat estimates for 68 cents. Revenue of $2.88 billion narrowly beat estimates for $2.68 billion. 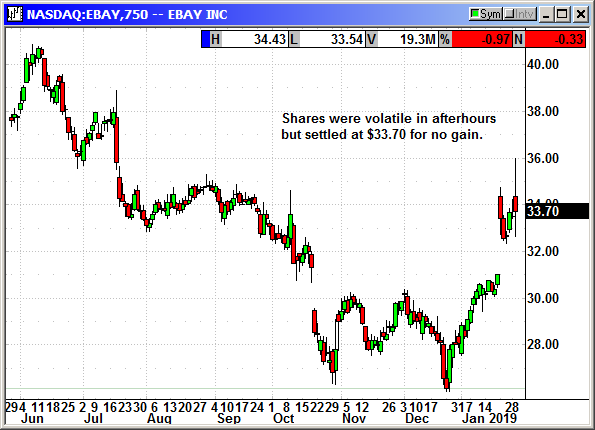 However, Ebay broke new ground by announcing a dividend of 14 cents payable March 20th to holders on March 1st. The company said it also plans to buy back $5 billion in stock in 2019. They guided for Q1 earnings of 62-64 cents on sales of $2.55-$2.60 billion. Full year guidance was $2.62-$2.68 and sales of $10.7-$10.9 billion. Analysts were expecting 61 cents and $2.66 billion for Q1 and $2.59 and $11.17 billion for the full year. There are a lot of big names on the calendar for Wednesday. Facebook, Boeing, McDonalds, Microsoft, Paypal, Tesla and Visa are the headliners. Four of those are Dow components. Alibaba should also get a lot of attention because of their guidance on China's economic health. 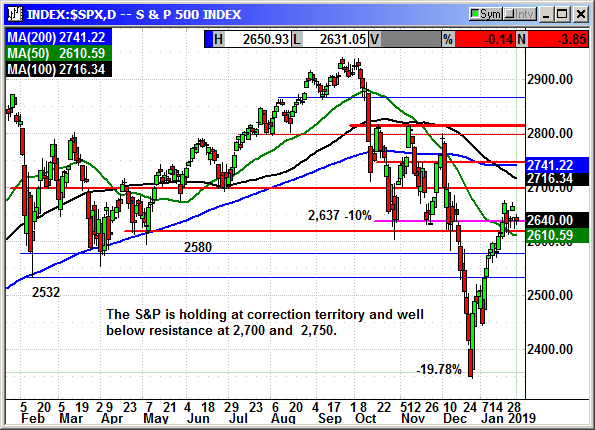 The S&P cannot seem to get past that resistance at 2,650. We have been holding there for over a week. Each of the spikes over that level were sold hard the next day. I fear we could have some challenges in our future that will make further gains tougher to accomplish. The number of companies with weak guidance or outright earnings misses is growing. 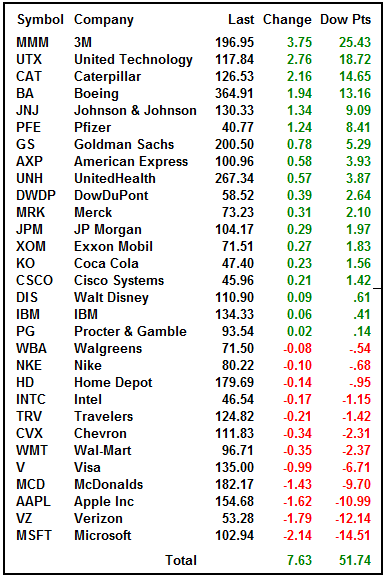 Only 135 S&P companies have reported for Q4 and the blended earnings growth is currently 14.2%. This is a sharp decline from the final 28.4% growth we saw in Q3. As of 9:AM this morning the earnings forecast for Q1 had slipped to only 1.8% earnings growth. Every day that number erodes a little further. If the Q1 forecast falls into negative territory the market is going to react badly. I would suspect that even just a few more tenths of decline will trigger some investors to begin heading for the sidelines to avoid the rush. The expectations for a trade deal with China may be the only thing currently holding the market up. When/If a deal appears, it should be good for an instant rally but in the end, it will be earnings that give it staying power. That metric is not looking good. The Dow was lifted by the tariff sensitive stocks with MMM, CAT and BA in the top of the list. The arrival of the Chinese delegation to Washington set the stage for the showdown. 3M earnings helped even though they warned of weakness in China. 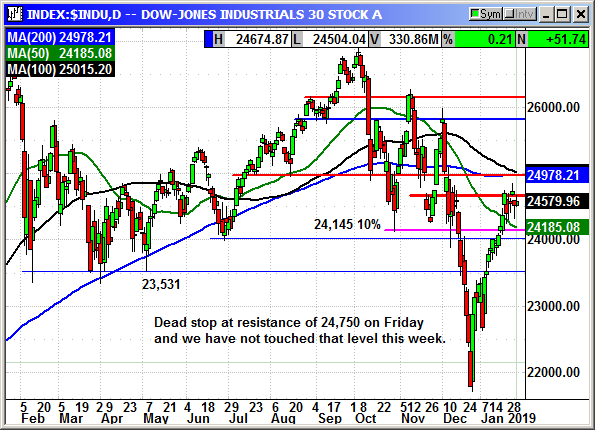 The Dow has closed over resistance at 24,750 twice in the last week and both times it was sold hard the next day. This week we have not even touched that level. Apple's 8-point afterhours gain will give the Dow a 56-point head start at the open but other earnings could subtract from that lead. 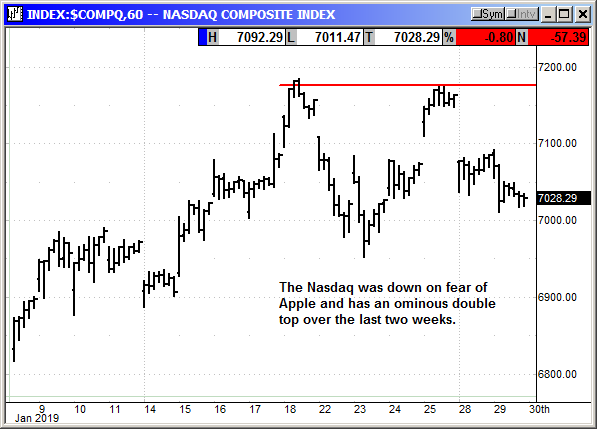 Like the Dow and S&P the Nasdaq is stuck in a range but Apple's gain could provide a boost on Wednesday. The Nasdaq futures are holding at +35 but that is only about half of the 57-point Nasdaq loss on Tuesday. 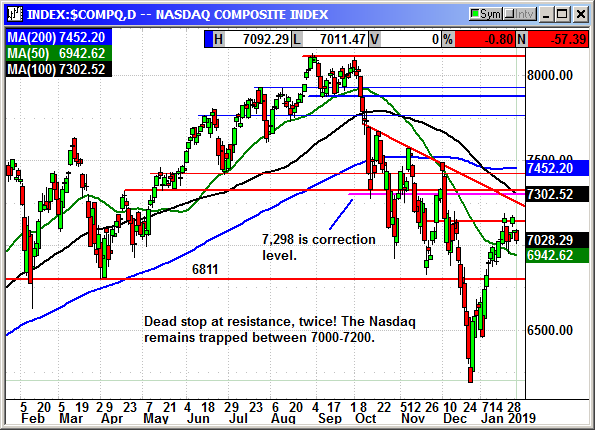 There is solid resistance around 7,175 and we closed at 7,028. That futures lift is just enough to get us back to resistance. Amazon is down about 125 points from last week's high and they report earnings on Thursday. Somebody is selling Amazon and it could be related to the pending divorce settlement. All the other Amazon headlines are positive. Q4 is their best quarter they are not expected to faceplant on earnings, but anything is possible. 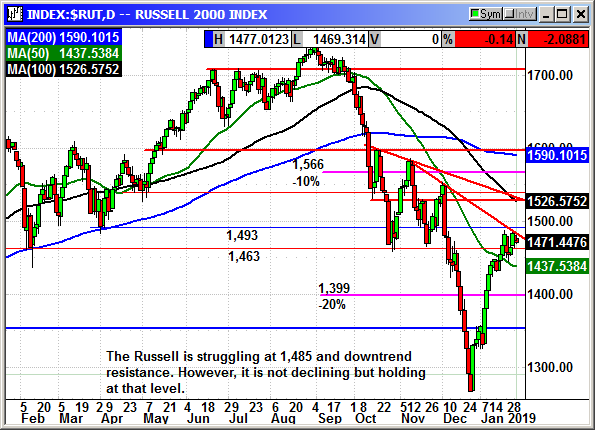 The Russell 2000 is holding its recent gains but struggling to move higher through resistance at 1,485. However, the Russell futures are negative tonight. Their positive performance over the last several days could have been money moving from big caps to small caps. 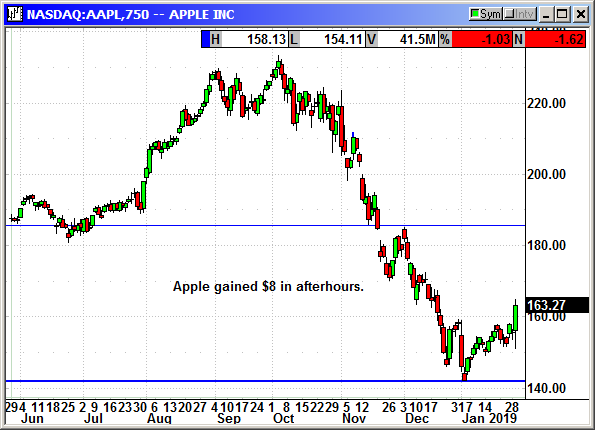 The positive Apple earnings may have convinced some that it is safe to move back to the big cap arena. In case you can't tell from my remarks above, I think we are heading for some trouble. That declining earnings estimate for Q1 is going to be a problem. Think of it as a fuse on a bomb. When it burns down to zero all heck is going to break loose. 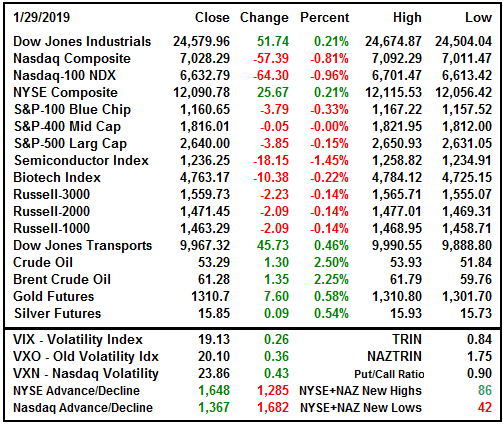 I would recommend caution until we get past the current resistance levels holding back the indexes and we get past this week's earnings and China trade meeting. You never know, we could be at war with China by Friday. There is no rush to add positions.